Written on March 10, 2015 . Posted in Announcements + Updates, Liberal Arts. A solo theatre performance by critically acclaimed actor/playwright Dan Hoyle is planned for Wednesday, March 11, in connection with Avishek Ganguly’s (Assistant Professor, Literary Arts and Studies) ongoing “Performance Studies” course, funded by the Turner Theatrical and Performance Design Fund. The performance will take place at the Black Box Theatre at AS220 in downtown Providence. The show is free and open to the public. From the creator of the award-winning show TINGS DEY HAPPEN and THE REAL AMERICANS comes a new piece of journalistic theater about finding connection in our digital age. 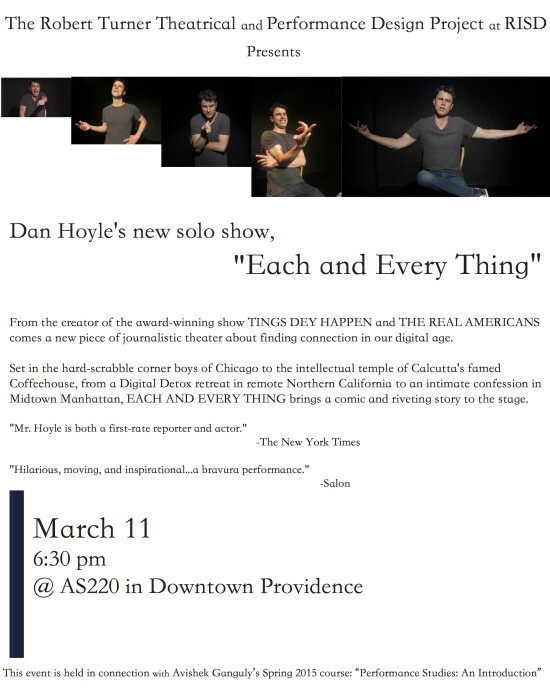 Fresh off his critically-acclaimed run of THE REAL AMERICANS at Culture Project last Spring, Dan Hoyle returns with his brand new show EACH AND EVERY THING. From the hard-scrabble corner boys of Chicago to the intellectual temple of Calcutta’s famed Coffeehouse, from a Digital Detox retreat in remote Northern California to an intimate confession in Midtown Manhattan, EACH AND EVERY THING brings a comic and riveting story to the stage.